The development of micro- and nano-mechanical systems (MEMS and NEMS) foreshadows momentous changes not only in the technological world, but in virtually every aspect of human life. The future of the field is bright with opportunities, but also riddled with challenges, ranging from further theoretical development through advances in fabrication technologies, to developing high-performance nano- and microscale systems, devices, and structures, including transducers, switches, logic gates, actuators and sensors. 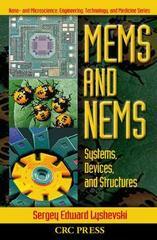 MEMS and NEMS: Systems, Devices, and Structures is designed to help you meet those challenges and solve fundamental, experimental, and applied problems. Written from a multi-disciplinary perspective, this book forms the basis for the synthesis, modeling, analysis, simulation, control, prototyping, and fabrication of MEMS and NEMS. The author brings together the various paradigms, methods, and technologies associated with MEMS and NEMS to show how to synthesize, analyze, design, and fabricate them. Focusing on the basics, he illustrates the development of NEMS and MEMS architectures, physical representations, structural synthesis, and optimization. The applications of MEMS and NEMS in areas such as biotechnology, medicine, avionics, transportation, and defense are virtually limitless. This book helps prepare you to take advantage of their inherent opportunities and effectively solve problems related to their configurations, systems integration, and control. Each chapter also includes a References section.